The Digital Research Library of Illinois History Journal™: The 1948-49 Chicago Railroad Fair. 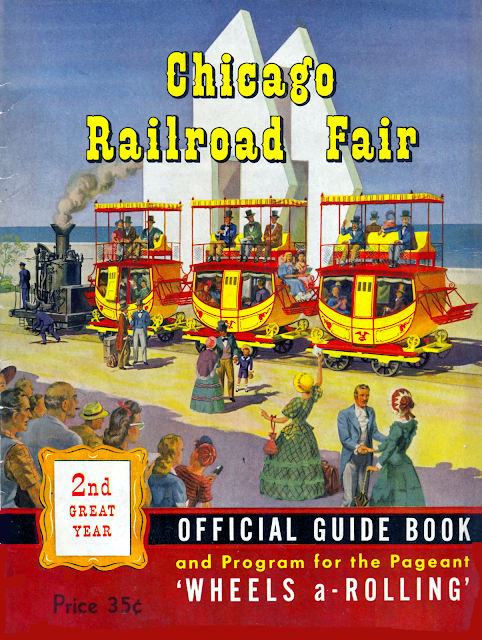 The Chicago Railroad Fair was an event organized to celebrate and commemorate 100 years of railroad history west of Chicago, Illinois. 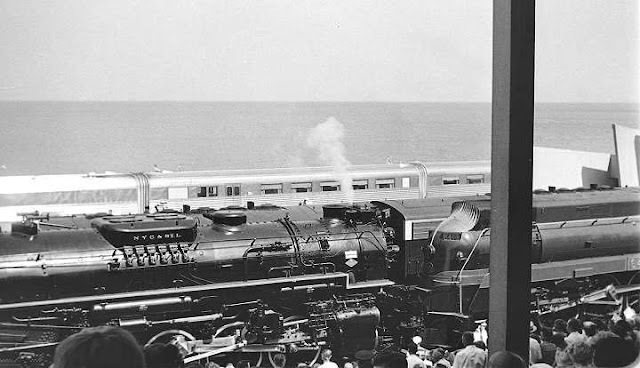 It was held in Chicago in 1948 and 1949 along the shore of Lake Michigan and is often referred to as "the last great railroad fair" with 39 railroad companies participating. 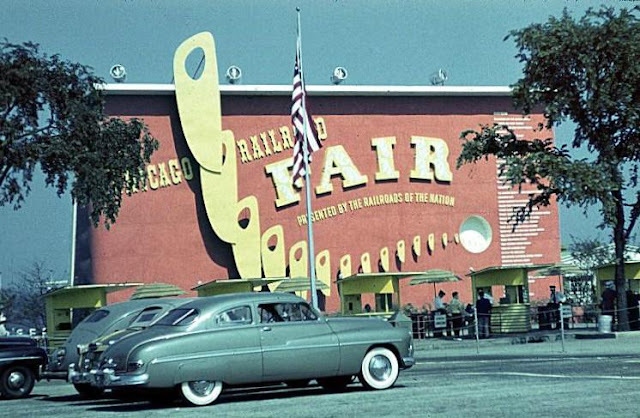 Entrance and Ticket Booths to the Chicago Railroad Fair. The fair was rapidly planned during the winter and spring of 1948, and originally scheduled to run between July and August of that summer. 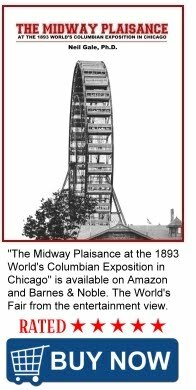 Erected on 50 acres of Burnham Park in Chicago between 21st and 31st Streets the fair opened after only six months of planning. 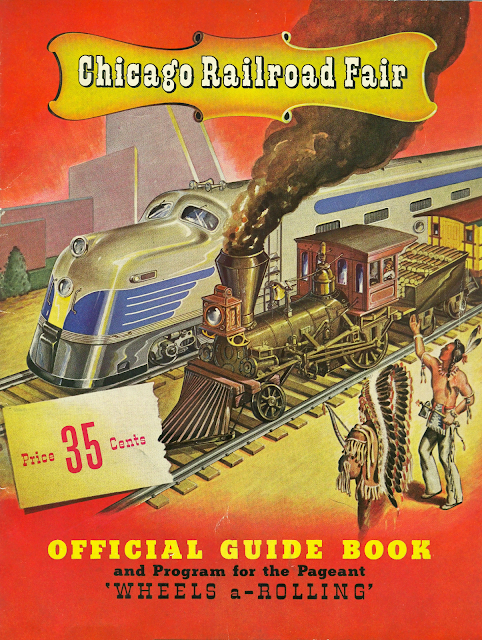 I purchased both the 1948 and 1949 Chicago Railroad Fair Official Guide Books. Just click on the covers caption to open it in PDF format. A grand opening for the fair commenced on July 20 with a parade that featured such spectacles as a military marching band and a replica of a troop train, a contingent of cowboys and Native Americans, a replica of the Tom Thumb, the first American locomotive, and the spry, octogenarian widow of Casey Jones, who served as honorary Grand Master of the parade. 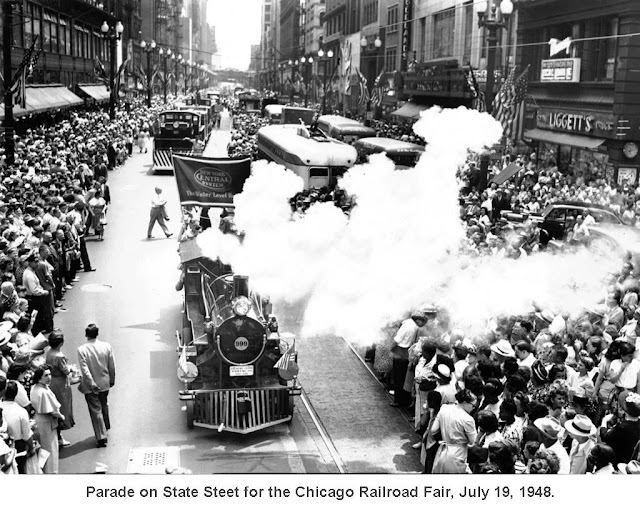 One dollar was the price of admission, and, except food, all the attractions, displays, exhibits and shows were free. 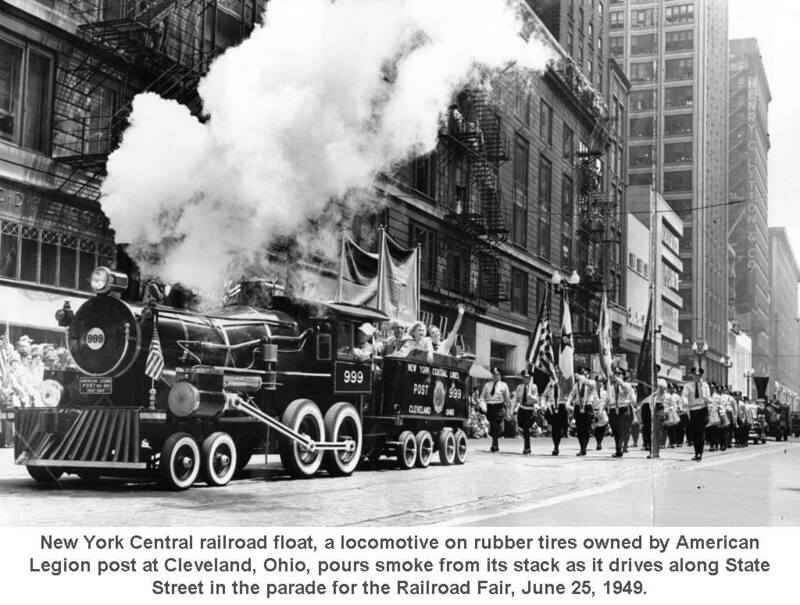 Besides the thirty-nine railroads who participated in the fair, there were more than twenty equipment manufacturers, including General Motors. 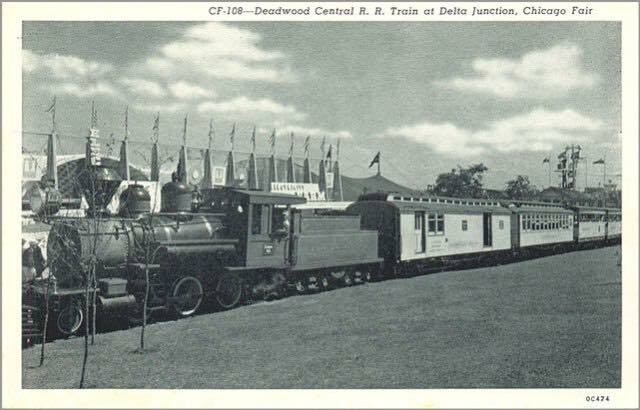 A highlight of the fair was the presence of the Freedom Train. 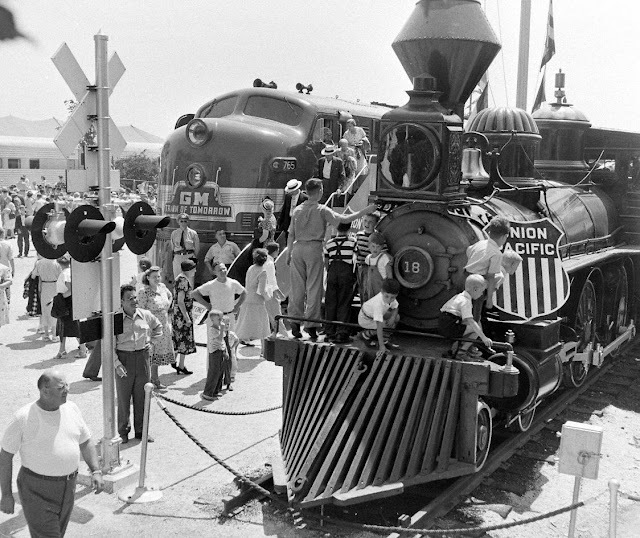 The Freedom Train travelled the country from September 17, 1947, through Jan 22, 1949, and was at the Railroad Fair from July 5 – 9. It held many documents and artifacts from the National Archives. 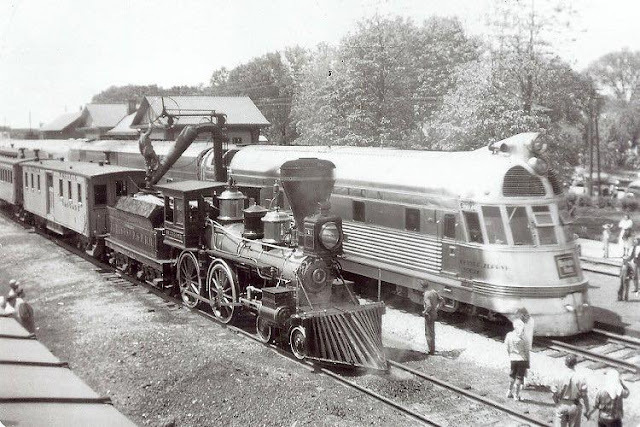 September 27, 1948, Time magazine photo. Available for public viewing were the original United States Constitution, Declaration of Independence and the Bill of Rights. Security of the documents was the responsibility of the Marine Corps. CLICK ON THE MAP FOR A HIGH-RESOLUTION IMAGE. 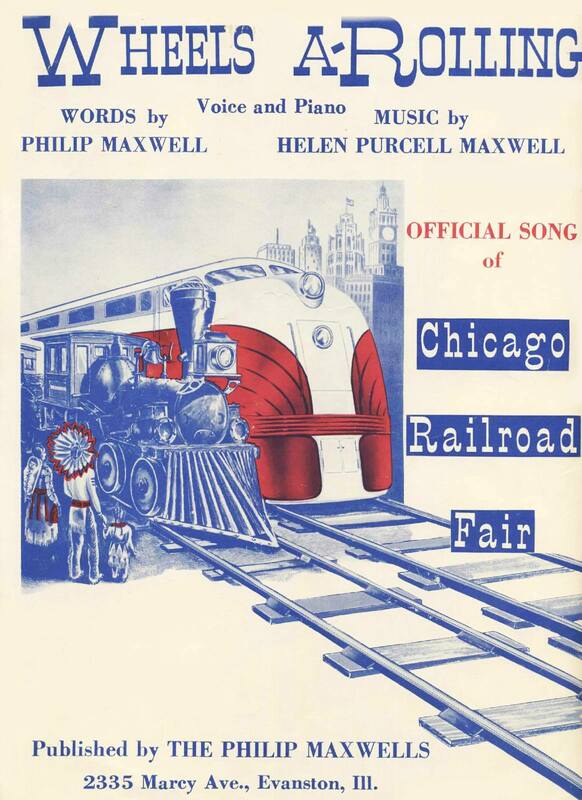 Wheels A-Rolling: 100 Years of Railroad Progress 1948 Chicago Railroad Fair.